Total Downloader Official Site - Play and download any type of files from internet in a TAP! Total Downloader allows you to download any files from internet in a Tap! 1. Visit your favorite sites using the integrated multi-tab browser 2. Start a video, select a photo or document on the website. 3. Click on the download button that automatically appears. 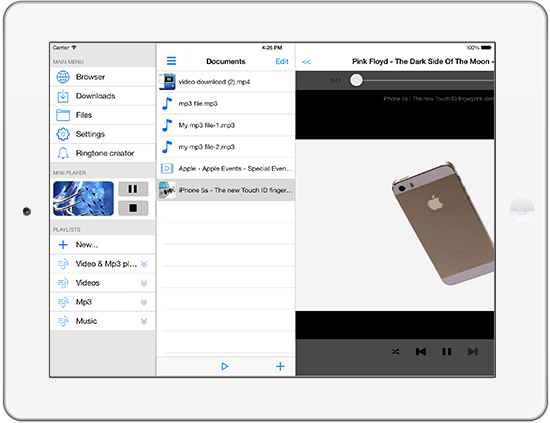 Downloads all iOS supported video formats: mp4, mov, m4v, 3gp, Divx, Xvid, avi, mkv, flv, Ts..
Total Downloader is an universal App, compliant with iPhone, iPod and iPad. It's available worldwide exclusively through the Apple Appstore. Total Downloader is fully translated in English, Italian, German, French, Portuguese, Spanish and Chinese. It's very easy to use, thanks to the embedded Quick-Start and the exaustive FAQ section. User can also send email support request directly through the App.